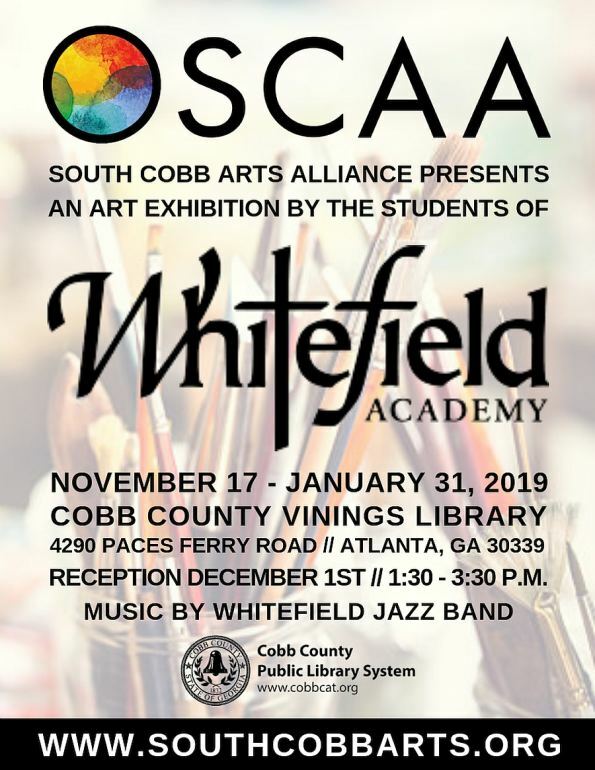 The SCAA partners with Vinings Public Library and Whitefield Academy, bringing exceptional student artwork to the Cobb community. POWDER SPRINGS, Ga. - Oct. 30, 2018 - PRLog -- It was announced today by the South Cobb Arts Alliance that they will be sponsoring a dynamic student art exhibit featuring the works of the young artists at Whitefield Academy, grades 10-12. The exhibit opens on November 16, 2018, and will run through January 31, 2019, at Vinings Public Library, located at 4290 Paces Ferry Road, Atlanta, Georgia 30339. This exhibit is free and open to the public during library hours. The public is cordially invited to attend and join in celebrating these creative minds at a reception for these talented art students at Vinings Public Library, on December 1, 2018, from 1:30 through 3:30 p.m. There will be a special performance by the Whitefield Academy Jazz band. When asked about this inspiring exhibit, Rebecca Brown, the Fine Arts Teacher at Whitefield Academy who is overseeing the student participation, stated, "The work on display is created by 10th-12th graders at Whitefield Academy. The work consists of drawings and paintings done by students in advanced visual art classes. At Whitefield Academy, the arts faculty inspires students to create sincere and significant work while recognizing the beauty of self-expression through the arts. Believing that all students have natural artistic ability waiting to be developed, instructors encourage these young artists to discover and cultivate their God-given creativity." The Whitefield Jazz Band is under the direction of Stacy Quiros, Whitefield Fine Arts Director, who shared, "The Band program consistently represents a department of excellence with offerings in Beginner, Marching, Concert, and Jazz Bands. Graduates have matriculated to Juilliard School of Music, Berklee, Furman, and dozens of other schools to pursue college training. One distinguishing feature of Whitefield's band philosophy is that students are encouraged and do share their gifts and talents with the community." Nichole Knox, Vinings Library Manager, echoed the enthusiasm for this enthralling event, "Vinings Library is excited to host the special exhibit featuring student artists from Whitefield Academy. It is great when people see libraries as vibrant community spaces encouraging engagement with the creative and cultural arts communities where we serve." SCAA President San Miller expounded upon the SCAA's stance to support our schools' student artists, "South Cobb Arts Alliance renews its commitment to student artwork and the performing arts whenever and wherever we can. Student art continues to inspire the artists in all of us. Their exhibits have become a cornerstone of our outreach to bring to the community displays by both our local artists and students. Do not miss the amazing work by these talented young people!" Since 1972, South Cobb Arts Alliance has presented the South Cobb neighborhoods with hallmark events that celebrate the arts and open doors to those in our community who might otherwise not partake in the arts. The South Cobb Arts Alliance invites the community to join their membership and become a part of their energetic and diverse group of volunteers and supporters. The mission of the South Cobb Arts Alliance, a 501(c)(3) nonprofit organization, is to build the community by encouraging appreciation and active participation in the visual arts, performing arts, and local heritage. The SCAA strives to advance to high levels the artistic standards of their members, their community, and the general public, by offering opportunities to extend experiences, to increase skills, and to share understanding, philosophy, techniques, and knowledge. For more information on South Cobb Arts Alliance, becoming an active member or a valued volunteer, visit the website at www.southcobbarts.org. For media inquiries, interviews, etc., contact scaaorg@gmail.com or phone 864-571-0597.